Rare Whisky Auctions: Investment Opportunity? DO RARE vintage whiskies traded at auction represent a viable asset-class for the larger private investor? asks Leon Kuebler for WhiskyInvestDirect. In recent years, single malt whiskies from Japan as well as from Scotland have broken new auction records. This trend shows little sign of abating. At Bonhams on August 28, 2015 the HK$3.8 million (£321,000) sale of a 54-bottle lot, the Hanyu Ichiro Malt "Playing Card" series, smashed the record for the largest prices paid for a single lot of whisky. At the same auction, a bottle of 1960 Karuizawa sold for HK$0.9m (£76,750), which also broke the record price for a single bottle of Japanese whisky. In the previous year, on January 18 2014, a 6-litre Lalique decanter of Macallan M single malt auctioned at Bonhams became the most expensive bottle of whisky ever sold at HK$4.9m (£381,600), beating the previous record set in 2010 by the equivalent of nearly £100,000. Such numbers are eye-catching, but they do represent the very extreme of the market – and each of those three examples notably set their records in Bonhams' Hong Kong auction room. 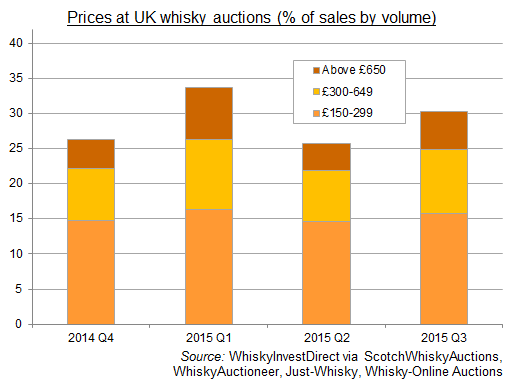 Looking at UK whisky auctions, both the overall size and growth of this market are due to the rise of online sales. One site alone, ScotchWhiskyAuctions, was responsible for auctioning 24,881 lots in 2014, representing over 73% of UK sales. Altogether, some 33,998 bottles of single malt Scotch whisky were sold at auction in the UK in 2014, with a total value recorded at £7,656,000. That gives a mean average price of £225 per bottle. Even if a percentage included some non-single malt Scotch whiskies, the sheer volume of bottles auctioned monthly online far exceeds those offered by even the largest traditional whisky auction house on a quarterly basis. Of these online whisky auction houses, four specialist sites dominate the volume of UK sales. Across four auctions at these websites sampled quarterly between December 2014 and September 2015, the average median sale value (half were dearer, half cheaper) was £77. The highest median value at any one sale was £100. (NB: Data recorded for all auction sites includes non-Scotch single malt whisky, such as Japanese, Irish, bourbon and blended whisky, as well as lots of multiple bottles in the results. In the case of Scotch Whisky Auctions, Whisky Auctioneer and Whisky-OnlineAuctions, total lot numbers also include non-whisky lots, such as paraphernalia and other beverages). At first glance, such trends may seem encouraging. Comparing Q3 2015 results against Q4 2014, the median price achieved at each of the four auction sites rose, averaging a move from £71 to £79 per lot – a 12.3% improvement inside one year. Moreover, the percentage of whisky items achieving ultra-premium prices (arbitrarily set on our table as £650 and above) also rose at all four sites, increasing from 4.1% of lots sold in late 2014 to 5.4% of those auctioned in summer 2015. But across those periods the data are mixed, and the number of lots exceeding a sale price of £150 – a level below which the vast majority of bottles available at mainstream retail outlets are priced – has not demonstrated a consistent upwards trend in either real or proportionate terms. Instead, it would appear that the general driver behind the growth in value of the UK whisky auction market has been a sharp increase in the volume of lower-priced sales. The overwhelming majority of whiskies available at retail cost between £20 and £150. So there is little in price terms to differentiate most whiskies sold at auction from those available in the shops. All but one of the median sale prices in the 16 auctions sampled above were in double figures. For the individual investor, retailers typically limit each customer to a maximum of one or two bottles of each collectible release, as demand for potential "investment-grade" bottlings is typically far higher than supply. That makes it very difficult to allocate a sizeable sum to rare whiskies at initial release. Figures for the first half of 2015 indicate that the UK whisky auction market for single malt Scotch has continued to grow year-on-year at roughly the same rate for volume and value (35.2% and 33.8% respectively). These figures, when seen in the context of median sale prices below £100 per bottle, would suggest that the whisky auction's market appeal as an "investment-grade" opportunity is heavily dependent on the performance of a minority of headline-grabbing bottles. If the growth of the whisky auction market is driven primarily by sales volume, as the above data indicate, a further conclusion may be drawn; namely, that the majority of bottles purchased at auction are in all likelihood done with consumption, not investment, in mind. Seen in this light, the fact that volume growth is leading the auction market's value growth could be good news for the whisky industry, because it implies levels of consumer demand high enough to sustain a pronounced increase in the supply of rarer bottles without depressing retail prices. Whisky auctions provide an invaluable way for consumers to broaden their horizons beyond those bottles currently available at retail. Indeed, they may be seen as active contributors to the high levels of interest whisky, both Scotch and otherwise, enjoys today. Profits can be made by 'picking winners', but this method requires a significant level of specialist knowledge, combined with a degree of serendipity. Nevertheless, there is little to suggest, in general terms, that scarcity alone is a sufficient cause for consumers to purchase whiskies at auction at prices far in excess of the standard retail price. This general trend would have to be observable to make bottled whisky a compelling investment class. There is one potential exception, however. As noted above, each record price for rare whisky in recent years has been set at Bonham's in Hong Kong. In the next article, we will explore whether traditional auction houses, in either Britain or Hong Kong – or trying to arbitrage between them – offer an opportunity for substantial investment.